The border area of India and Bhutan has been seriously impacted by the closure of many of the local businesses related to the tea estates in the area which has caused significant poverty. The local people are very poor and many of the men have left the area to find work in other parts of India. S and S are pioneers in faith-based community development in this area and there are a number of components to the work they do, one of which is running a hostel for 16 children (2 girls and 14 boys) ranging in age from 7-15. These children are from both sides of the Indo-Bhutan border. Some have no family to care for them, some come from vulnerable families and some have no school in their village so they stay at the hostel during school term. The hostel is an essential part of their strategy here as it supports community development around the Indo-Bhutan border and enables them to have an impact in the lives of these young people. One of the other community developers in the area, C, lives with the boys and is dorm dad. He is a really nice guy and the boys love him. S and S came here as community developers in 2005. They realized that there were many children in the communities they were developing that were vulnerable so they opened a hostel. Initially there were just a few children who came to stay because of the distance from their homes to the nearest school. Then people began to request that they take on other more vulnerable children. Three members of Bright Hope World's Executive Committee met S at a missions conference in Rome in June 2015. Subsequent to that BHW's Field Director visited twice and also met S at the PITH conference in Indonesia in July 2016. In late 2016 a decision was made to commence partnering with S and S.
The families of the children are beneficiaries as they are able to go to or stay in remote places while their children are educated. The children too are well looked after and are getting a much better education than if they were not in this hostel. Some of the children do not have families so they would be very vulnerable and uneducated if they were not here being cared for. There is a real work underway in this area. It has taken time to get established and to create a beachhead but that is now in place, the team is growing and the work is starting to spread. S and S are a most delightful couple and love the children. They are here for the people and everyone is part of the family. There is a clear strategy in place dealing with immediate issues and thinking medium and long term. S and S are in charge. They have 11 years of experience in the area. There is another couple who handle the day to day requirements - cooking, firewood, cleaning etc. C is a local guy, 23 years old, and stays in the dorm with the boys. 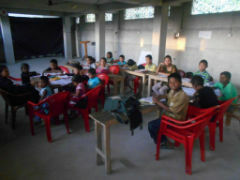 The vision of the hostel is to provide a safe place for the children to grow up in and receive a good education. They would like to grow the hostel to no more than 40 but this is dependent on them being able to find the resources to finish the building and upgrade facilities. They plan to continue running the hostel as they have in the past. There are no plans at present to increase the number, although, who knows what will happen. These people are instinctive carers of the underdog and would find it hard to turn a genuine case away. The annual budget provides uniforms, books and shoes for each child at the start of the school year and also assists with the day to day expenses of operating the hostel (food, utilities, staff). SO is 14 years old. His parents divorced and both remarried but neither wanted him so he was being cared for by his grandmother. She was not really capable of looking after the boy and things were a struggle. When she heard about this hostel she asked if he could come. He was not going to school and life would have become very difficult for him. When he came to the hostel he was 13 and they have put him into grade 1 as he had never been to school. SU's father and mother died when he was small. He therefore went to live with a grandmother but she could not send him to school. He would go get work from the age of 8 or 9 picking rocks from the river and selling them to people. The grandmother asked if he could come to live in the hostel and they accepted him. He goes to visit his grandmother in the school holidays.